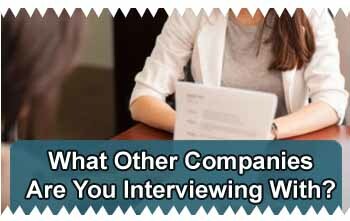 What other companies are you interviewing with? This question is yet another tricky question and it always throws candidates in confusion. Why are they asking, and how much do they actually need to know? This question can be easily answered without thinking too long, , a smart response requires a careful balancing act but still remember, this is actually a lot trickier than it sounds, and how you answer this question can make or break the interview. There is no need to be nervous, instead you just need to be honest with your answer. Whether you’re interviewing with a couple of other companies or you are in the first interview ever, don’t feel pressured to share genuine information about your job hunt. Interviewers ask this question because they want to gauge your interest in their role and make sure that you’re as interested in the position as the company is in hiring you. The interviewer is trying to grab the following information about you. - Are you serious about the industry and position? - How marketable you are? If you are attracting a lot of attention from other companies you will be perceived as quite marketable. - How focused are you with the company and the position they are offering? - How many industry/ competitors are offering the same position in the market? If there are a lot of available roles within a particular industry they may need to offer more money to secure the best candidate. - How long have you been in the hiring process with other companies? They can quickly make up the decision-making process on their part if they believe in your potential and capability. - How valuable and in-demand candidate are you ? - They want to make sure they will be able to hire you before anyone else does. - Never try to be boastful about yourself by saying you have never applied to any other company unless the company you are interviewing with has approached to you directly through recruiter or agency. - Highlight why this position is a top choice for you unlike others. - Highlight your excitement for this specific position. - Avoid stating that this job is the only one you are considering. - Mention that you are also applying in a different position in the similar industry, but more interested in the position they are offering. This highlights some critical abilities and skills that you possess. Let them know you can handle a multi-task. Answer : Next week, I do have an interview, with one of the reputed Company for ABC position. I would prefer to keep confidential a name of this company for their privacy. But I can tell you that, based on what I know, this opportunity is particularly exciting for me because this position has exactly the challenges which I’m looking further in my job role.